Mysuru: Mysuru City Corporation (MCC) is taking all steps to make Ganesha festival an environmental-friendly one this year. As a first step, it has announced that Ganesha idols with more than four feet in height and made of paper moulds will be banned in city limits. The idols less than three to four feet in height and made of clay only will be allowed to be installed. MCC Commissioner K. H. Jagadeesha clearly stated this at a meeting of the manufacturers and sellers of Ganesha idols held at the MCC premises this morning. “We will not compromise on this at all. Even toxic paints cannot be used as this will cause environmental harm. Hence, every one of you must cooperate since it is in the interest of protecting the environment. Otherwise stringent action will be taken against those who violate the rules,” he said. 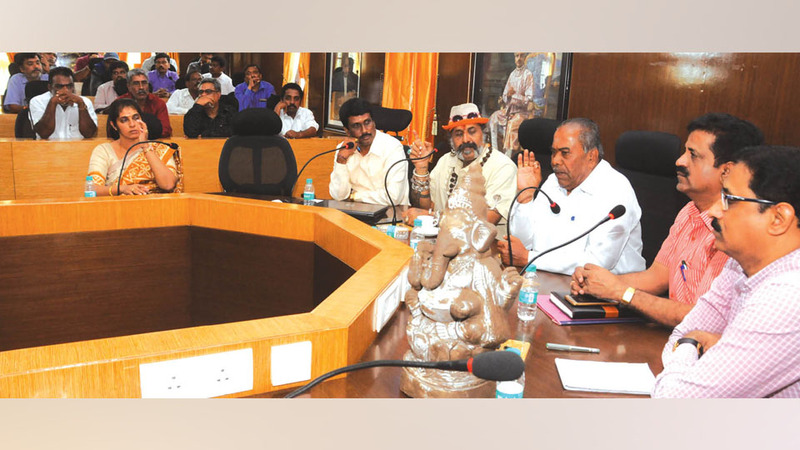 He said that the MCC has decided to take a firm stand on pollution-free Ganesha festival as the city has to maintain its top Swachh city tag. The manufacturers and sellers of Ganesh idols raised objections that if they are not allowed to use paints then it will be difficult for them to sell the idols. Since Ganesha idols made out of clay only is allowed, the customers will not buy the idols once the lappa (knifing paste) is pasted to cover the cracks. Hence, it has to be painted to cover it. As there was strict enforcement of use of non-toxic paints, they demanded that the Corporation should itself provide such paints for them to use. The Officials from the Karnataka State Pollution Control Board (KSPCB), who were also present, assured them that they would provide such paints but warned that if they mixed it with chemicals and were found out during the raids, then stringent action would be taken against them. All the associations and organisations, who want to install the idols in public places, must take licence from the MCC for the same. The idols will not be allowed to be sold on roadsides. The sellers will be provided space in vacant plots to sell the idols made out of clay. Nearly 50 manufacturers and sellers participated in the meeting. MCC Health Officers Dr. H. Ramachandra and Dr. Nagaraju, KSPCB Senior Engineer Prakash, Corporators Snake Shyam, K.T. Cheluvegowda, Ashwini Ananthu, S.B.M. Manju and others were present. MCC opisors are useless. When they say ‘The idols less than three to four feet in height’ – what does this mean? It can be ‘less than three’ or ‘less than four’, how can it be less than three to four? Do these people have common sense, it shows how lethargic they are. Their intention is to keep it vague so that they can make money later from manufacturers who make idols between three and four feet. And who complained against road side stalls? It runs only for 2 days, it creates a festive mood and 90% of people are happy with this. What is the problem with that? Inefficient MCC does not do its daily jobs in the city, but goes overboard on during hindu festivals. These manufacturers are another set of scoundrels, who will do anything for money, has no devotion in their jobs and for the idols they make. They are saying outright lies by saying that people won’t buy unpainted clay figures. Wrong, if there are no painted idols, we hindus will not stop praying to lord ganesha, we will instead go back to our older right ways of doing the prayers by buying unpainted clay dolls. Ban all these deceitful corrupt liars manufacturers and allow only fresh unpainted clay dolls like before. Let people buy half feet gowri ganesha or one feet dolls depending on their affordability. Nature should not be compromised just to feed the greed of MCC opisors, manufactures and public.